Have you ever wished you could walk out of your home into a beautiful garden full of singing birds, busy honey bees, and fluttery butterflies? With a little bit of planning this spring, you can! La Grange, IL is for the birds! Literally. Who doesn’t love the sound of birds singing in the garden? There are dozens of species of both native and non-native birds that winter over, pass through, and stay all year. And if you want them to visit your home, be sure to not only put up feeders and birdhouses, but also consider a more natural approach. According to The Illinois Department of Natural Resources (IDNA), there are four things to consider when trying to attract birds: food, water, shelter, and breeding. Since most of our native birds love to nest in trees, bushes, and shrubs, the IDNA recommends “edging” your garden with trees and shrubs (planting around the outside edges of your garden). Also, when possible, they recommend creating a “skyscraper” effect with the trees and shrubs (planting taller trees behind shorter one and shorter trees behind shrubs and bushes). The brochure mentioned in the link above, offers comprehensive tables of which trees, shrubs, and plants attract specific birds. And since birds will take care of insect pests in your garden as they are feeding, this is a great natural option for pest control. Be sure to avoid planting Autumn olive, honeysuckle, or privet, as these are non-native plants to our area, and birds are really good at spreading the seeds in places we do not want them. Should you find that you have some birds that are becoming a nuisance (destroying your yard and/or your structures), contact the Illinois Department of Public Health before trying to deal with those Canada geese, gackles, house sparrows, starlings, and pigeons yourself. Save the honey bees with flowering plants they love! 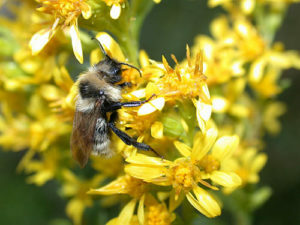 We all know that our nation’s honey bees are in danger due to dwindling food supply, and Illinois’ bee population has been hit particularly hard in recent years thanks to some extra harsh winters. So by planting colorful flowers for them, you not only do a good deed (and encourage them to make all that delicious local honey), but your garden will thrive thanks to their pollinating efforts. The best thing you can do to help the honey bees is to keep your garden pesticide-free. Pesticides not only taint the honey the beekeepers produce, they also weaken the bees’ immune systems. 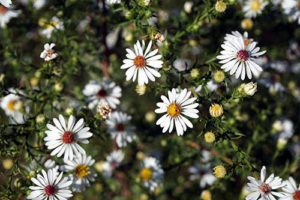 The second best thing is to plant flowers like aster, cone flower, goldenrod, hardy ageratum, and witch hazel. Since there aren’t a lot of feral bees in Illinois anymore, we need to do all we can to help the local beekeepers, like 6th Avenue Honey, a family-owned honey producer right here in La Grange, IL. And speaking of pollinators–with the right plants, you can also encourage beautiful butterflies to visit your garden. Much like we do, butterflies prefer fragrant flowers in a warm, sunny spot protected from wind. Their favorite colors seem to be purples and pinks. They like flowers on which they can balance while they sip nectar. Also, large groups of the same flower clustered together work better than a mix. But don’t forget the different stages of a butterfly’s life. They also need a place to lay their eggs, something for caterpillars to eat, and a place to cocoon for their metamorphosis. Fortunately, caterpillars like weeds, but if you don’t like them in your garden, consider the aptly named butterfly weed and butterfly bush or some mint or verbena for the hungry, hungry caterpillars. Above all–avoid pesticides and herbicides, or you’ll be looking at a beautiful flora, but no fauna. Gardening with our winged friends in mind has many benefits. By avoiding pesticides and herbicides and by planting native plants, you support the natural resources of Illinois. By planting trees, shrubs, and flowers that attract birds, bees, and butterflies, you enhance the natural beauty you see every day. And by planting a beautiful garden, you definitely improve the curb appeal of your home when it’s time to move up or downsize. Nancy Miller, Realtor with Coldwell Banker has over 25 years of experience in the La Grange, IL area helping people make the most of their homes and find the right home to fit their needs at any stage of the home buying and selling process. Connect with her expertise today!